Pedalling Squares: The Quieter Curse Of The Rainbow Jersey. Looks really unlucky, doesn't he? He had three main objectives for this year-his oft stated goal of winning Milan-San Remo in the rainbow jersey, defending his green jersey at the Tour, and winning gold in the Olympic Road Race. Milan-San Remo turned its toes up in what appeared to be a very pointed fashion. You know how Milan-San Remo goes: lots of non-threatening breakaways, the favourites conserving their strength over the bulk of the mammoth 300K course, and no genuine combat between the favourites until the Cipressa at least, and often not until the Poggio. It was quite a surprise to see Liquigas hammering it up La Manie at the halfway mark while the gap lengthened on a suffering Mark Cavendish. Cav would have suffered there regardless, but the pace and the resulting gap might not have been insurmountable if it weren’t for the unexpected sight of Liquigas hooning it up the front. Nothing wrong with that, of course. Finding ways to beat your opponents is what racing is all about, but it did feel like a moment designed not to win the race but simply scupper one of the favourites. Much like the negative tactics deployed against Cancellara in last year’s classics, you get the feeling that no one really wants to race Cavendish anymore. That could have rotten effect on Cav’s Olympic hopes. As nation in the UCI’s top ten rankings, Team GB will have five riders in the race. That’s Cav and four helpers. Four guys to peg non-threatening breaks to just a couple of minutes. Four guys to chase down threatening breaks. Four guys to bring everything together in the last 15-20K and then maintain a pace so fast that no one can get off the front. Four guys to form a train that needs to crank Cav up to full speed and release him 250 metres from the finish. And that’s without taking into account the potential for bottle carrying/escorting him through multiple climbs of box hill. It’s too big an ask for four guys. Ordinarily that wouldn’t matter. Ordinarily there’s just enough parity between leading sprinters that alliances can be formed between several teams who all feel that their best bet is to get their guys into a sprint. But the Italians aren’t looking at Petacchi, Guardini and Chicchi and thinking “What these guys really need is a chance to go head to head with Mark Cavendish.” The Spanish aren’t thinking that about Oscar Freire, the Americans aren’t thinking that about Tyler Farrar. About the only nation other than the UK who might want it to come down to a sprint are the Germans, and that’s only because they’ve got so many sprinters and semi-sprinters it’s hard to see who else they can choose for the team, not because you’d seriously put your money on Greipel, Kittel or Degenkolb beating Cav in a sprint. Cav may have won the test event with a full sized team and only two ascents of Box Hill, but he’ll need much greater manpower to repeat the feat in July, and it’s hard to see who will think it's in their interest to help. Last year we saw Cancellara pay the price for his dominance in the classics as teams resorted to negative tactics to freeze him out of contention. 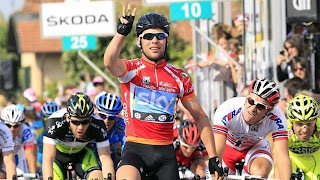 Come the Olympics, Cav’s dominance in the sprints may well bring about his own “Your boy is too strong” moment. Finally, there’s the Green Jersey competition at the Tour. When Cav finally signed for Sky there was plenty of ebullient talk of a two pronged attack on yellow and green. During the close season Dave Brailsford was all over Radio 5 and most specialist cycling publications talking about the strategy for chasing both jerseys (basically, taking lots of strong domestiques. This crafty strategy must have shocked Cadel Evans, whose title defence team was going to be composed of a couple of stagiares, two work experience kids and Skippy the Kangaroo). By March, however, Brailsford was saying that chasing too many objectives was a “recipe for failure.” Since then, we’ve seen that Sky’s lead out, while perhaps a smidgen faster than the old HTC train, isn’t quite as unflappable or as good at positioning. To be fair, Cav has the most competetive road sense of anyone in the bunch, so he hasn’t been too badly hampered, but by his own admission he’s dished out some criticism to his team mates. At the same time, Wiggins is looking superb, having already won two stage races by way of Time Trial and even Sprint victories. The only thing that really seems to trouble Wiggo these days are the real monster climbs with spells of over 20%, and this year’s Tour doesn’t have any of those. Now all of this just me thinking aloud, obviously. But ever since Cav signed for Sky, I’ve been thinking that for one year only, he should put the Tour to one side. He’s 26, and he’s already the best in the world at what he does. We’re going to spend the five or six years watching him win stages, classics and jerseys. He’s in contention for the points jersey at the Giro right now (although the near vertical final week might shake that). Wiggins will never have a better chance than this, and Sky need to fully devote themselves to it. If that turns out to be the case, then that’s Cav’s other objective for the year shot down. Perhaps if he hadn’t been so clear about what he wanted from this year it wouldn’t seem so much like the curse was striking again, but to me it looks a little like the rainbow bands still retain a little of their dark power.